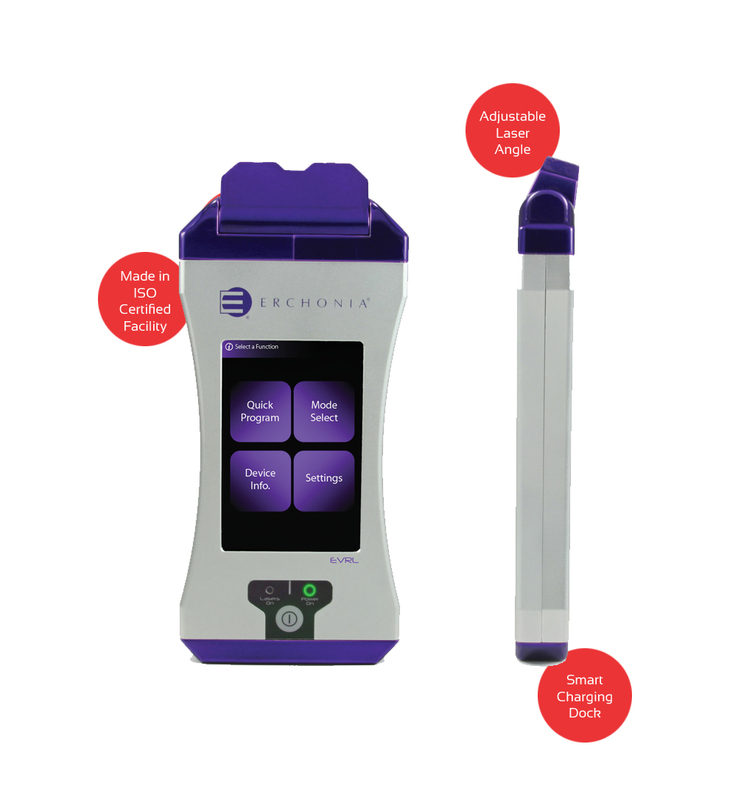 The Erchonia Violet and Red Laser is the newest Erchonia handheld in “smart phone” size with a user-friendly graphical user interface (GUI) and a sleek new cord free design. Operating at a wavelength of 405nm and 635nm, the Erchonia Violet and Red Laser provides the practitioner with an innovative tool for treatment versatility. The exceptional versatility of this violet and red laser pain treatment allows doctors, chiropractors, physical therapists and other medical professionals to target a broader range of conditions with a single, easy-to-use device. With exceptional clinical research and FDA market clearance in treating conditions such as these, EVRL lasers are a trusted and proven treatment approach, allowing practitioners to change patients’ lives without the harmful side effects associated with traditional treatment options. Each of Erchonia’s cold laser products is designed to effectively target muscles and tissues and promote natural healing. Low-level lasers stimulate the body’s light-sensitive components to produce an effect similar to photosynthesis in plants — the cells’ mitochondria are stimulated, encouraging the cell to produce more ATP naturally. And with Erchonia’s handheld red and violet laser treatment device, you get more than just a typical cold laser. The violet and red lasers produce different wavelengths to stimulate different types of healing and provide for greater treatment versatility. Medical professionals can now treat more conditions with a single device and create a more personalized treatment regimen. The Erchonia red laser, operating at a wavelength of 635nm, has been proven effective in relieving chronic pain such as neck and shoulder pain. The healing properties of red laser pain treatments provide patients with a safer, healthier alternative to drugs and corrective surgery. The Erchonia violet laser, on the other hand, operates at a lower wavelength of 405nm to target dermatological conditions, and violet laser pain treatment has been successful in the reduction of acne and the promotion of healthier skin. Together, the red and violet lasers provide unmatched treatment flexibility. Any medical professional understands the significant benefits of an effective handheld treatment option. The “smartphone” size of the cord-free EVRL device allows for easy portability between offices and enables staff to spend less time setting up equipment before each session. The intuitive GUI also ensures ease of use without any training or extensive knowledge. Those advantages combined with the unparalleled benefits of the device’s powerful red and violet laser pain treatments ensure that this unique device is a superb addition to any medical setting. 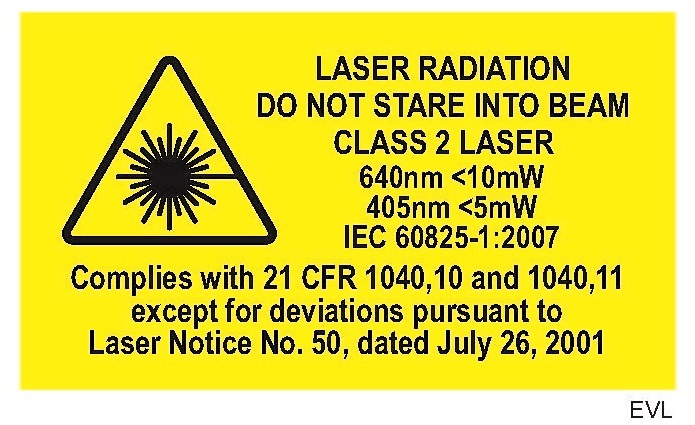 Contact us today for more information on purchasing this laser for your clinic, or search for a provider to find an Erchonia treatment option near you.